Study Fuels Debate Over Widespread HIV Testing, And Its Cost : Shots - Health News Researchers say testing everyone in the country at least once a year could reduce HIV infections, but it would be costly. Even so, advocates say it would be money well spent. An AIDS symbol is displayed on the North Lawn of the White House in December, 2010. But, another panel, the U.S. Preventive Services Task Force, a behind-the-scenes government panel that evaluates medical evidence and has a knack for arousing public outrage (see, mammography), hasn't come around to that view, advising doctors only to screen 'at-risk' people. The group last reviewed evidence for broad HIV screening in 2005, and it decided after the latest CDC recommendation not to update their opinion. The panel plans to release, in a year or so, a review that would include the Annals study, an official said. 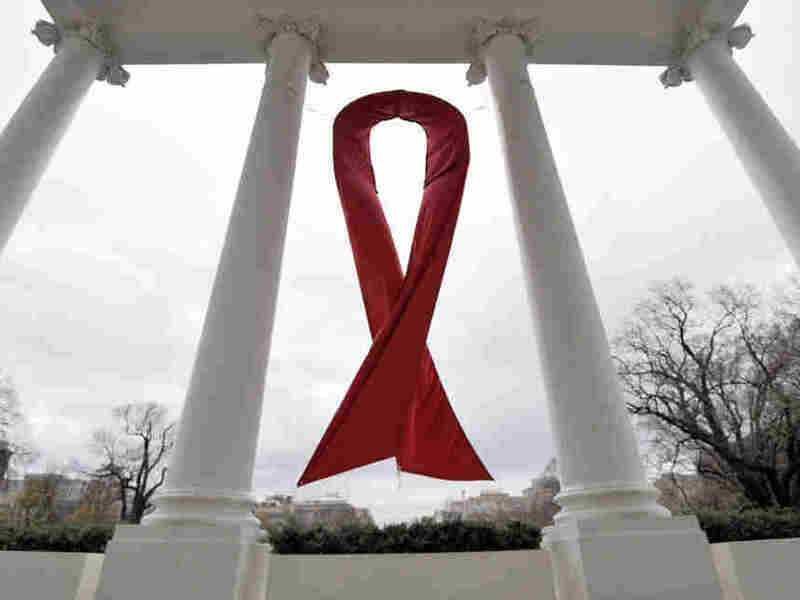 If they back the suggestions outlined there, "it would be a good first start," said Andrea Weddle, executive director of the HIV Medicine Association, an advocacy group that represents doctors and researchers. Weddle's group and other HIV advocates have promoted broader recommendations to the task force, according to the federal agency that houses the panel. But, it's unclear how the group will weigh in. Dr. Ned Calonge, the panel's departing chairman, told us over the summer that "the bar for … doing something to a person who is already well needs to be really high."